Chase Sapphire Preferred Card Reviews - Best Travel Rewards Credit Card? The Chase Sapphire Preferred Card is a formidable travel rewards credit card offering a 50,000-point bonus as a promotional offer and allowing you to earn points on travel, dining, hotels, and more. The Chase Sapphire Preferred (CSP) has long been heralded as the best travel rewards credit card on the market. However, just because the experts say a particular card is the best choice doesn’t mean it’s the best choice for you. That’s something that you have to decide based on how your particular financial situation squares with the Sapphire Preferred’s rewards and benefits. In our review, we’ll give you a basic run-down about the 50,000-point offer, whether or not the average person can spend enough to achieve this, the benefits of the card, its overall terms and conditions, and finally, our recommendation about who should get this card and who shouldn’t get it. By the time you finish reading through our expert insights, you should have a good idea if this credit card is right for you. Chase Sapphire Preferred Card's main offer is 50,000 bonus points for customers who spend $4,000 within the first three months of opening the card. Chase is also offering an additional 5,000-point bonus for anyone who adds an authorized user (spouse, significant other, etc.) and makes a purchase within the first three months of opening the account. In total, you’re getting the chance to rack up 55,000 points within the first three months of owning your card. And you get those points through some pretty attainable benchmarks – adding a user (which can be done during the application process) and using the card to pay for about $1,333 worth of stuff each month for the first three months. If you use your Chase Sapphire Preferred to pay for these things, you’ll nearly hit $4,000…$3,943 to be exact. Throw in a random birthday or holiday present and you’re well on your way to the 50,000-point bonus. Chase’s terms and conditions say that, once you make your $4,000 in purchases within the first three months and your account isn’t delinquent, you’ll get your points within six to eight weeks of hitting the $4,000 mark. But remember, that $4,000 includes a few strings: balance transfers, cash advances, buying cash (traveler’s checks, for example) or interest payments are not included in that total. Also, if you currently have a Chase Sapphire Preferred you can’t get the offer, and if you’ve cashed in on a CSP new cardmember bonus in the past two years you aren’t eligible for the reward, either. Every time you make a purchase on travel or at restaurants, Chase gives you double points for these purchases. So, that means that when you spend $10 on dinner, you get 20 points. If you spend $450 on a flight to see your in-laws, you get 900 points. The key, of course, is what is included in the “travel purchase” and “restaurant purchase” categories. And for that answer, we pored through Chase’s FAQ section to find what we needed. What’s excluded? Websites like Airbnb that private owners use to rent out vacation properties, the stuff you see in your in-flight catalog or menu, anything you buy on board your cruise and tourist attractions and sightseeing stuff. As for the “restaurants” category, all sit-down and fast-food places are included. If it’s a restaurant located inside a theme park, hotel, sporting venue or casino, there’s a chance you may not get double points. All other purchases made on your card will earn you 1 point per $1 you spend. Based on our research of average household spending, we believe that this card can earn you, with bonuses included, around 29,650 points. If you use those points to book travel through Chase’s travel portal (Expedia runs it), they’re worth around 37,000 points. If you transfer those points to one of Chase’s 11 travel partners (seven airlines, four hotels), you could get even great value out of them. For example, if you transfer 30,000 points to the World of Hyatt program, you could book six nights at most Hyatt Place properties. Those six nights have a cash value of at least $700. However, if you don’t want to deal with all the confusing redemption options, those points are worth $296.50. The Chase Sapphire Preferred is like most credit cards when it comes to fringe benefits. If you use the card to make travel purchases or rental car purchases, you get a certain level of complimentary insurance on those purchases. You also get Chase’s purchase protection, which includes protection against theft and damage for new purchases, as well as extended warranty protection. What will your APR be? Great question. You won’t know until you’re accepted for the card. But we do know that the minimum APR will be 17.74% and the maximum APR will be 24.74%. The percentage rate Chase gives you is based on your credit. Better credit means a lower APR. Remember, though, you only pay interest on your balance if you don’t pay your card in full each month. Late fees are $15 for balances less than $100, up to $27 if between $100 and $249.99 and up to $37 if the balances are $250 or more. Balance transfers are $5 or %5, whichever amount is greater. For cash advances, you’ll pay $10 or %5, whichever amount is biggest. The first year you own your card you won’t pay an annual fee, but after that, you’ll be charged $95 per year for the CSP. Knowing if a credit card is the right fit for you is a matter of understanding what it has to offer and how its rewards and fees compare to other credit cards. Exactly how valuable this card is compared to the other cards in the chart has a lot to do with how willing you are to use Chase’s redemption options. For example, if you like to keep things simple, the card’s 29,650 points are worth $296.50. Yearly rewards of around $300 aren’t that good compared to the U.S. Bank FlexPerks Travel Rewards, the Discover it Miles and the Capital One Venture. However, if you are willing to use those points in Chase’s travel portal transfer the points, the value goes up to between $370 and at least $720, making this card a rewards powerhouse. The Sapphire Preferred’s 50,000-point sign-up bonus is the best in the bunch. The card’s Achilles heel is its lowest APR, which, at 17.74%, is 4% higher than the Discover it Miles and 3% higher than the Capital One Venture. » See Also: Is the Chase Ultimate Rewards Program as Great as You Think It Is? The strength of this card is the value of the points you earn in your first year. Based on our calculations, we believe the average household can earn about 80,000 rewards points the first year. Since you can transfer those miles to 11 travel partners in the Chase Ultimate Rewards program, they’re more valuable than the cash value you’d get if you earned 80,000 points with the Capital One Venture Card. For example, you could transfer 7,500 points to the Marriott Rewards program and book a Category 1 hotel room that would normally cost, say, $135. The cash value of those points is $75, but since you have the flexibility to transfer them to Marriot, they have an actual value of $135. The downside to the card is double. First, the number of points you can earn every year is pretty low compared to the Capital One Venture or the Discover it Miles, both of which can earn you at least 8,000 points more than the Sapphire Preferred. Also, the card’s best APR is really high. At 17.74%, you’re looking at an APR that’s a full 4% higher than the Discover it Miles. 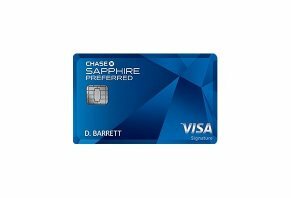 If you aren’t convinced that the Chase Sapphire Preferred is the right card for you, that’s okay. There are plenty of options out there, the most popular of which we’ve covered in our ranking of the Best Travel Rewards Credit Cards of 2018. Write a Review for Chase Sapphire Preferred Card!